What is in the federal economic statement for energy efficiency? 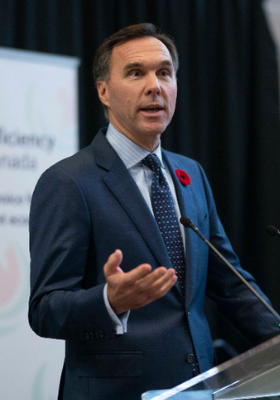 Yesterday, Finance Minister Bill Morneau released the fall economic statement. The major theme of the statement was the need to make progress for a more equal and sustainable Canada, while grappling with concerns about economic competitiveness with recent US corporate tax cuts and international volatility. Rather than broad-based corporate tax cuts, the federal government opted to introduce more targeted measures to direct private capital towards productive investments. Here are some elements of the statement that relate to energy efficiency. The economic statement allows businesses to immediately write off the full cost of machinery and equipment used in the manufacturing and processing of goods for tax purposes (Class 53 under the Income Tax Regulations), as well as specified clean energy generation and energy conservation equipment (classes 43.1 and 43.2). The former could enable energy efficiency upgrades in the manufacturing sector, and the latter includes technologies such as cogeneration, solar heating, heat recovery equipment, and district energy systems. This is strengthening the tax incentives already provided through accelerated capital cost allowance. There is also an “accelerated investment incentive” that allows for a larger first-year tax deduction for capital assets. This includes a 100% deduction for computer software. The economic statement announced that it will allow anyone to access the National Building Code for free (builders previously had to purchase it). This will cost $13.5 M per year. This initiative could help ease the adoption of a net-zero energy ready building code and a model code for existing buildings. Minister Morneau announced an “Advisory Council on Climate Action” focused on the transportation and building sector. The council will be chaired by the prominent Québec environmentalist, Steven Guilbeault, and Tamara Vrooman, President and CEO of VanCity Credit Union. It will report directly to the Finance and Environment Ministers. This announcement demonstrates that the government acknowledges the need to take targeted action in the building and transportation sectors, where energy efficiency is a key climate solution. It also builds on recent task forces, including the Expert Panel on Sustainable Finance. The economic update discusses the need to modernize regulations to prepare for innovations. This includes creating a test bed for freight platooning technologies. This involves hitching two or more heavy vehicles together to create a “road train”. It can improve freight vehicle fuel consumption and lower costs. There is also mention of autonomous vehicles, which could have implications for the future of energy efficient and low GHG mobility. The fall economic statement also announced an Export Diversification Strategy. It will be important to emphasize the global market in energy efficiency is growing, while other energy sectors are experiencing downward investment. The fall economic statement is a prelude to the next budget, which will be released in early 2019. Efficiency Canada has been emphasizing the linkages between energy efficiency and building a more competitive and clean economy. Many of the initiatives announced in the fall economic statement could be leveraged by targeted energy efficiency strategies. In our Budget 2019 Priorities document, we highlighted the benefits of supporting energy efficiency services throughout Canada, developing the energy efficiency workforce, and mobilizing private sector capital. Consider that expanding programs to implement industrial energy management systems would ensure Canadian companies make use of the new tax incentives, while improving energy productivity and reducing emissions. Supporting workforce development initiatives would complement making building codes freely available. It will ensure the more advanced building practices forthcoming in new model codes are effectively implemented. Finally, the fall economic statement took an approach that emphasized the need to direct private capital towards productive investments. There is an opportunity to direct private sector dollars towards energy efficiency upgrades if the government takes a leadership role in removing barriers and creating the building blocks for a well-functioning market in energy efficiency finance. We aim to see the federal government build on its initiatives, and recognize that targeted policies will improve the energy productivity of our buildings and industry, to train the workforce for a low-carbon economy, and to create a robust energy efficiency marketplace. A more energy efficient economy is a more productive, competitive, and clean economy.